On October 7th, Rebekah's class went on a Community Field Trip. 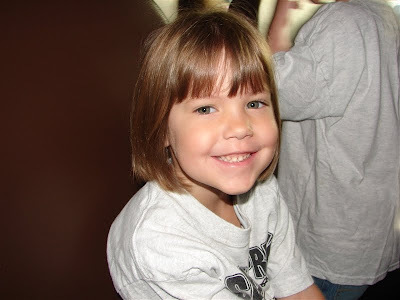 This was Rebekah's first field trip and school bus ride. She was so excited to get to ride a school bus! I was able to ride on the bus with her and help chaperon the trip. The first stop was just down the street from the school - Knights Grocery Store. They were able to tour the store and learn more about our community helpers within the store. Rebekah's first stop was in the produce department. They got to see and name all the vegetables and even got to taste some grapes! 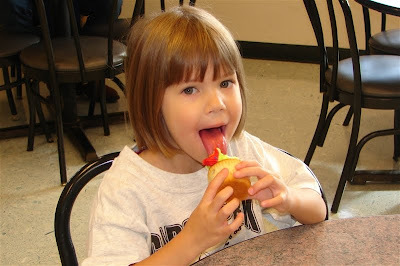 The next stop on the tour was the bakery. We got to talk to some of the bakers and they had a table set up where everyone got to decorate their own cupcake and then eat it! The last stop was the floral department. Each student received a red carnation and made a card to attach to the flower. Here are some photos from the bus ride and Knights. Here is Rebekah with one of her good friends, Jenna. We met Jenna this summer in gymnastics. 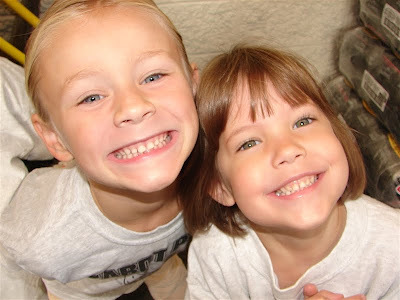 They were so excited to be in the same pre-K class. I like it because I've made a great new friend and we've been able to help each other out several times this year! Don't they look happy? After we left Knights, we headed over to one of the Cabot Fire Stations. The kids were so excited. 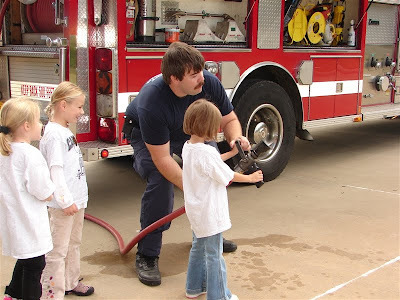 First, every kid got a chance to spray the water hose like they were putting out a fire. 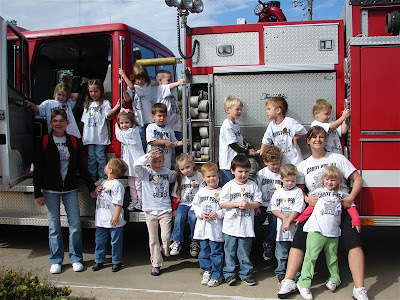 Next, everyone piled on the firetruck for a class photo. 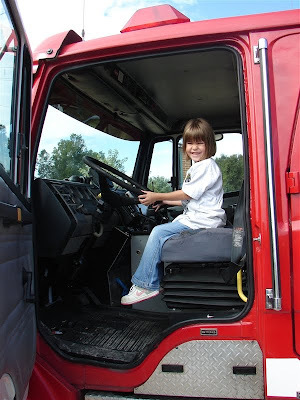 After climbing all over it, everyone was able to sit in the drivers seat and pretend to race to a fire! After listening to the loud sirens, we took a VIP tour of the firehouse to see where the firemen eat, sleep, workout and shower! 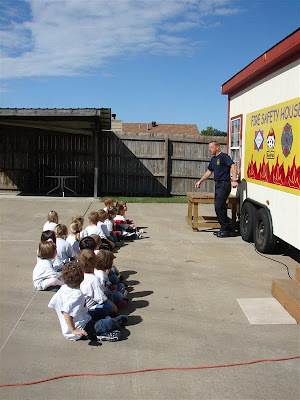 Lastly, the kids were able to practice what to do if there was fire in their own house - all in the Fire Safety House. We ended our time at the fire station with lunch and then headed back to school. What a fun trip and here are some pictures from the fire station. Rebekah was first to spray the hose. I wasn't quite ready with the camera, so I missed the shot with the water spraying. It's not easy to get 20 four and five year olds all posed for a picture! I almost forgot. 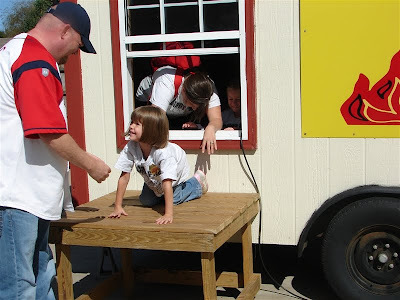 When we were done with the Fire Safety House and went back into the garage, we saw that an ambulance had arrived for the kids to tour. 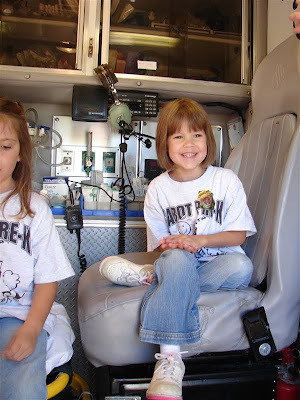 Our class then toured the ambulance and got to talk to the paramedics.